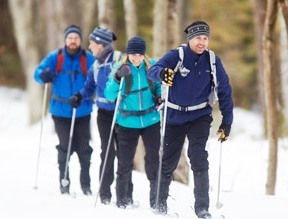 We are having a last minute Snowshoeing and Cross Country Skiing Event THIS SATURDAY, February 2nd from 1:00 to 2:30 pm. This event is for ages 12 and up and for all skill levels. We would love to have you join us and take-in the beautiful trails here by the Nature Center. The weather sounds great and we have fresh snow! Call 712-837-4866 by tomorrow, February 1st, to reserve your Snowshoes or Skis or bring your own.